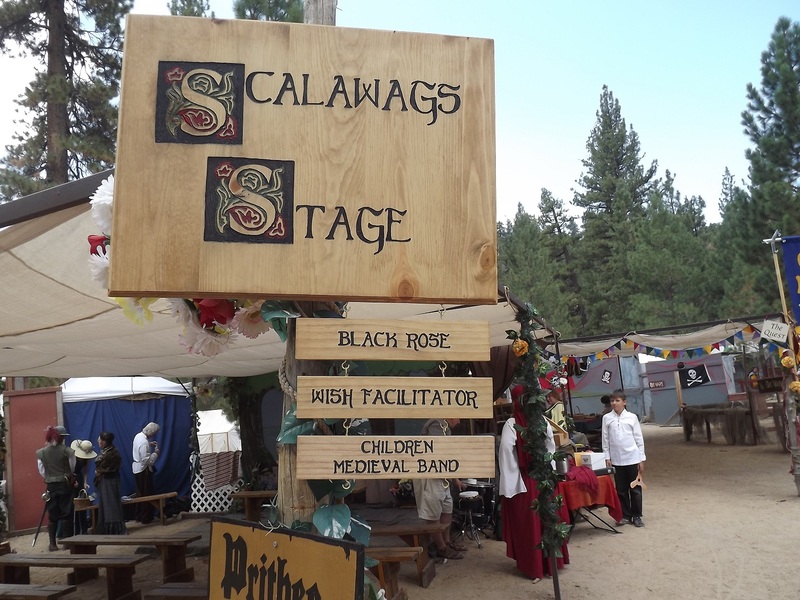 This year Children Medieval Band has been again invited to the Big Bear Renaissance Faire – http://bbvrsinc.org – and played their medieval repertoire on the Aug. 17-18th weekend, 3 shows each day. An impressive location, top of the mountain, 7000 ft altitude, with a beautiful alpine lake, this place is a fine touristic attraction. On each of their shows, the CMB kids added an acoustic version of the Rammstein song Ich Will, and played it successfully to an enchanted audience. Even the Queen of the Faire attended their show, mostly to watch the R+ cover performance! This is not the first time that CMB plays Rammstein music while the medieval flags are waving… They played Ich Will last year at the Escondido Faire and also at the Ventura Faire. One reason is that the kids are trying to add more intensity and unusual into their medieval package. The audience is enjoying it. Stefan, Olga and Cornelia presented 12 songs, including their showing-off number Mon Amy. Well done and proving once again that he is an unrecognized world champion as the youngest multi-instrumentalist. This may touch a nerve on some, but it’s a fact. Anyway, with the risk of being bombastic, we only try to advertise medieval music as a better educational tool for kids – for a better world. And an acoustic version of Ich Will (by Rammstein). Olga played her part on a small glockenspiel acquired 2 weeks before. The most interesting aspect of this video is the audience – the faire's Queen was there – and the fact that the Queen is a fan of "those minstrels from the kingdom of Germany" – Rammstein. A warm ‘Thank You!’ to all those who were present at the kids performance and showed their support by purchasing the CMB ‘7 Medieval Songs’ CD. Thank you, friends!